Solar-panel sunglasses are possibly the best and most logical solar gadget that you can ever think of. If you want to look at it from a rational perspective, then this device is quite useful and justified. Even though right now the design of such solar-panel sunglasses is not that attractive, it is quite clear that in the near future scientists and developers will be able to make this device even more appealing to the public. 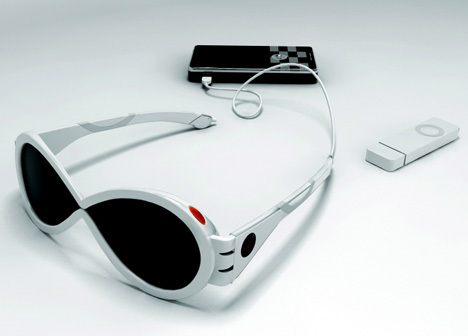 Right now with the help of such glasses it is possible to charge small electronic devices such as radio, mobile phone, e-reader or mp3 players and other. Therefore it allows you to make your stay in the sun even more enjoyable and useful. 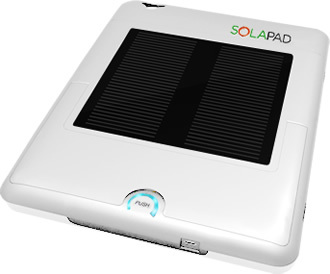 If you ever thought about solar powered gadgets you for sure have considered their usefulness and high efficiency rate. These gadgets can for sure make your life easier and make your energy consumption more environmentally friendly and green. Currently, eco designers have lots of projects in their minds, but they still pursue one, the most important goal – to provide consumers more productivity and satisfaction, staying environmentally cautious. They also follow modern market trends and design solar powered gadgets with the idea to help modern consumer. Therefore Solarwerks Inc., a fully-owned subsidiary of the global and diverse company Domark International, Inc., had designed a new attribute to all iPad holders – special device named SolaPad, which represents in itself a combined cover as well as a charging system for Apple's iPad.